Get your "Every-BUGGY loves music" PDF here! Valentine's Day is right around the corner. Are you ready to have some fun in your studio? This book taught me how important it is to surprise students and this post is full of ways to do just that. To start, the picture above is simple printable that I created to give my students. Just cut the cards, tape on a candy heart or a Hershey's kiss, and you're good to go! Get it here! I'll be honest - I only know of a couple piano Valentine crafts. Two are from Joy Morin at Color in My Piano. One is a piano cut-out that you can put on a box of smarties. The other is a piano heart that I've used for several years. Here's one of my photos from a couple years ago. Kids really did like it! Kids learn best when they're having fun and games are a great way to do that. Grab some heart erasers and you can make these games even more appropriate for the holiday! Puppy Love by Teach Piano Today. This is a cute, free game that focuses on note recognition on the staff. Music Cookie Memory Game by Sara Campbell. There are 3 different levels to cover all your students! Valentine Music Word Game by Wendy Stevens at Compose Create. There are several other games on this page too. Steal-A-Heart Game by Susan Paradis. If Susan created it, you know it's awesome. Musical Hearts by Sheryl Welles. This is a simple idea that you can customize to work for you. It works for private lessons or groups. Valentine Card Hunt by Susan Paradis. Hide the cards around your room and let your students go on a treasure hunt! If I Give You My Heart by Music for Music Teachers. Easy Valentine Songs by Susan Paradis. There are several to choose from. Valentine S'mores Composing by Melody Payne. Valentine's Day AND S'mores? Who wouldn't like that?! Valentine Composing Activity for Beginners by Susan Paradis. My students love these worksheets! Valentine by Jim Brickman and Martina McBride - arranged by Jacki Alexander. This is lovely! Valentine's Day Theory Worksheets by The Fun Piano Studio. There are several to choose from, including the dinosaur printable pictured above. Valentine's Day Puzzle by Sara Campbell. It's a fast way to review some basics! Valentine Note Scramble by Discoveries Piano Studio. This is cute for your youngest students. These have nothing to do with piano - but they are great nonetheless! If you're a Piano Mom - put them on your children's wish list! Roses are Pink, Your Feet Really Stink by Diane De Groat. This always made my son laugh! Froggy's First Kiss by Jonathan London. We love ALL the Froggy books! The Night Before Valentine's Day by Natasha Wing. Another favorite around here! God Gave Us Love by Lisa T. Bergren. There's a whole series of these great books! Curious about online lessons? We'd love to help! ​SO many teachers have asked questions about teaching online lessons! Upbeat Piano Teachers has the help you need. And exactly how to get your parents and students on board! And if the thought of online lessons makes you nervous, we've got you covered. I felt the same way at first! But you know what? I got brave. I tossed aside my fears and decided to conquer online lessons. You can do it too! Click here to learn more. My Completely Honest Review Of "Handy Houses"
I first started hearing about "Handy Houses: Memorize the Piano Keys in 5 Minutes" on FaceBook last year, but I hesitated to get it. It seemed to me that the story would encourage students to "count up" to find certain keys on the piano - and I don't teach keyboard geography that way. I'm pretty adamant about teaching the white keys by looking at the black keys. Nonetheless, last semester, I had a couple of preschoolers who were really struggling with keyboard geography and since I'm passionate about reading, I thought I'd give this book a shot. ​Turns out that I like Handy Houses quite a bit. Handy Houses is a cute story about 2 houses: a dog house and a people house. The story teaches students what goes on around each house. Every "character" matches up to a key on the piano. Students learn about the car, then they meet Duke and Ellie. The story continues up to the B key. ​The author, Samantha K. Perkins, even includes a keyboard where students can draw the story as a keepsake. You can copy the keyboard in the book or she gives you a link to a printable version. I think this is really brilliant because it helps students recite the story in their own words, thus making it more memorable. ​Handy Houses really does teach the keys on the piano. It works for older beginners and your very youngest students. The story is easy to remember. Children who enjoy reading will like this book. The drawings are cute and engaging. You really can cover this book in about 5 minutes. Having the kids create their own drawing of the story is a wonderful idea and is a great way for kids to work on this concept during the week. I have my students tell the story to parents, siblings, friends - anyone! Some really young kids don't understand that "grandpa" starts with a G or "Ellie" starts with an E. You have to supplement and explain that to kids. But once you do, they get it! ​Once my students learn the story, we review the "characters" in a DIFFERENT ORDER from how the book teaches the story. In the picture below, you can see what I'm doing with this student. ​See how she's coloring the G and A keys before the F and B? We talk about who lives inside the house before we review what's outside the house. I think that really helps to avoid "counting up" to find the correct key. Whenever we review the story - which is weekly in the beginning - I'll quickly run through the story from start to finish to make sure my student remembers everything. Who lives inside the dog house? Where is the people house? Who lives inside the people house? What is outside the people house? ​This completely solves my "fear" of learning the keys by counting up! ​Overall, I think Handy Houses delivers on the promise to teach kids the piano keys in about 5 minutes. I definitely plan to use it routinely with my youngest students. ​If you haven't tried it, I definitely think it's worth testing out. You can get it on Amazon for 9.99. My 16-year-old son, Matthew, is a self-proclaimed comic book nerd. 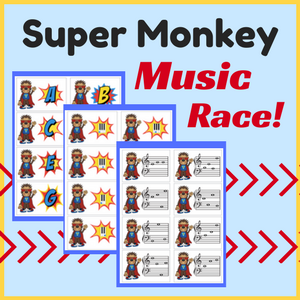 Because our entire family has become a little comic book crazy, I decided to create a music game with a "superhero" theme: Super Monkey Music Race! And - because we need more superheroes in this world - I'm making this game FREE! I've written before how important I think it is for teachers to make time for games. Philip Johnston talks about it in The Dynamic Studio and I've seen firsthand how it thrills my students! If you're one of those teachers who think they's no time for games, you'll LOVE Super Monkey Music Race because it's just that - super quick! There's no gameboard for Super Monkey Music Race. Instead, students play it right at the piano! I've included cards for every level. There are letter and keyboard cards for pre-readers. Older students will have to figure out full words on the staff. It's definitely a quick game - and you might actually have to race up AND down the keyboard if you need to make it last a little longer! Get your download below. I hope you enjoy and I'd love to hear your feedback! This game is a fun way to review note identification AND keyboard geography at the same time! Includes playing cards for students at ALL levels! Success! Now check your email to download your game! I'd like to receive the monthly newsletter! Yes, that's a crazy cat tape dispenser and it was one of my Christmas presents this year! Funny, right?! Organizational tools are kind of a running joke in my family. In fact, every Christmas Santa fills my stocking with notepads, pens, and sticky notes. Because that's what I love - I'm all about planning! Some people chose a "word" for the year. In fact, I've read 2 books on the idea: My One Word and One Perfect Word. Last year I chose the word "adventure" and this year, I've actually chosen TWO words: Jesus and Health. I know everything else in life will fall into place if I make these words my focus for 2017. The truth is that I have dozens of things I want to do in 2017, but if I set all of those as my goals, it'll be an epic failure. I won't even remember what half of them are! Instead, I made a list of all the projects that I hope to accomplish this year. Each month, I'll take baby steps to bust out those things on my list. By setting just 4 big projects, I know I can succeed! I'm a BIG believer in the power of daily habits. A few years ago when I set out to write 101 Piano Practice Tips, I got it done through daily habits. Every weekday, I'd write 3 tips. That faithful consistency not only helped me write my first book, it also taught be a powerful lesson - daily habits can change your life! My "something new" for this year is PowerSheets. To be honest, I was surprised when I got my package in the mail. I thought this was more of a calendar type planner, but it's not that at all. Instead, it's more of a way to set and track your priorities, goals, and ideas. I just love it! In the past, I've had several notebooks for different subjects, but with PowerSheets, I can track my year objectives in one handy binder. And the quality is awesome! I'd love to know what plans you have for 2017 and any resources that you use. I'm always open to learning new tips and tricks! My Top Tip for Saving Time on Facebook? Create a Custom List! If you're anything like me, you've set some goals for 2017. This post will help you save time so that you can actually work on achieving those goals! Don't get me wrong - I absolutely LOVE Facebook. But the way FB works doesn't really jive with the way I work. See....I'm more of a "stalker." That sounds terrible, but surely you know what I mean! I love reading what people post, but I don't always "like" or comment. Facebook rewards interaction. When you engage in posts, FB thinks "Hey - Tracy likes this person, let me show her more!" On the flip side, If I never "like" or comment on someone's post, FB thinks "Tracy isn't interested in this person, let's show her less." In the end, FB often shows me things I'm not interested in, simply because I'm not interacting. Fortunately, there's an easy fix for this! If you don't know what a custom list is, don't worry. Most people have never heard of it, but let me tell you - it's saved me a TON of time! ​A custom list is simply a list of your favorite people and pages. That's right - FB will let you create your very own list! And best of all - it's easy to create! Open up FB on your computer and look on the left side of the screen. Under "explore" click on your "friends list." ​Once there, you'll see that FB has already created a lot of lists for you. To compile your own list, at the top of this screen, you'll see a button to create a list. Click there, name your list, and start adding friends. You can also add pages that you like to see. I LOVE that you can add both! I also have a list of Piano Teachers that I follow. You can create as many custom lists as you'd like. ​What if you forgot to add someone? No problem! You can easily go back and add people to this list anytime. Or take people off. ​Just repeat the process by looking on the left side under "explore." Find the list name that you created and click on it. In the upper right hand corner, you'll see a button to "manage list." You can easily add people or pages. Now that your list is created, when you go to FB, don't waste time scrolling through the feed that FB gives you. Instead, go find your custom list and scroll through that. Trust me, you'll love seeing all your favorites! To find your list, go to FB and click on your friend list. (This is where you went to create the custom list. in the first place.) Just click on your list and enjoy catching up with your favorites! It's easy to find your custom list on a computer, but FB has changed their format and sometimes it can be hard to find on phones and tablets. On my iPhone, I have to go to Explore and then click on "Feeds" to find my custom list. I hope this saves you a lot of time! Let me know if you have any trouble and I'd love to know what you think! Young students need LOTS of activities to keep them engaged. This toolbox will keep you organized AND save you valuable time! Includes worksheets for every season! Success! 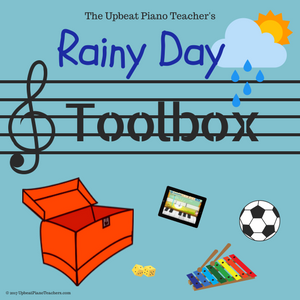 Now check your email to download your Rainy Day Toolbox!